Des Moines is experiencing a wave of momentum by continuously being rated as one of the top places to live and work. Iowa’s Capital City and surrounding communities are filled with outdoor adventures, amazing entertainment and a State Fair that borders on legendary. Living and working in Des Moines has been a great experience and we love being part of such a vibrant community. We will continue to give back and look forward to serving and helping the community for years to come! Bin There Dump That Des Moines is a Residential Friendly Dumpster system that reliably disposes of almost anything municipal trash handlers will not take. We know your time is important, therefore we prioritize delivering your dumpster when you need it. We offer 20, 15, 10, 6 and 4 yard dumpster sizes (footprint similar to a minivan) to conveniently fit your needs at an affordable price. Whether you are remodeling, landscaping, replacing your roof, or just cleaning out your garage, we have the right dumpster for you. We recognize how hard you work to keep your home looking good, so each bin is gently placed on top of our unique driveway protection boards to safeguard your driveway from harm. Our bins feature double doors that open to allow easy walk-in loading. This unique feature saves your back from having to throw heavy objects over the side of your bin. Our equipment and vehicles have been designed with the thought in mind to keep it simple yet versatile and, above all, Residential Friendly! We are able to get in and out of places that companies with larger trucks and equipment can’t even consider. We understand how busy life can get, so there is no need for you to be home when we drop off your dumpster. Once the bin is full, simply give us a call and we will pick it up. Our courteous, uniformed, professionals will be there on time, collect your bin, and sweep up to ensure your home stays looking beautiful! 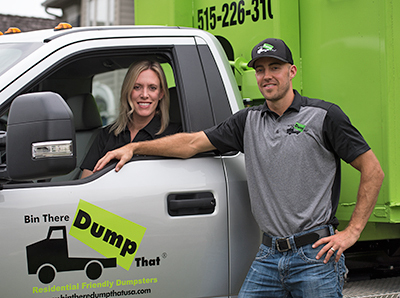 We are confident when you use Bin There Dump That Des Moines you will continue to call on us for all your future residential and commercial dumpster needs. If you have any questions or would like to book your residential friendly dumpster, please call (515) 226-3100 today. We look forward to serving you!